Where You'll Feel at Home Among Friends! 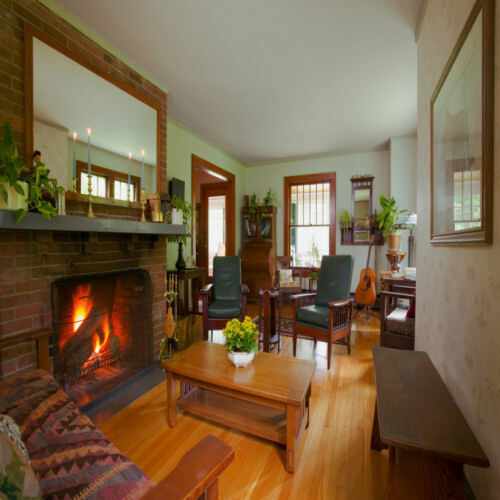 he Honored Guest Bed and Breakfast looks forward to accommodating your lodging needs on your next visit to the beautiful Southern Berkshires region of the historic Hudson Valley. 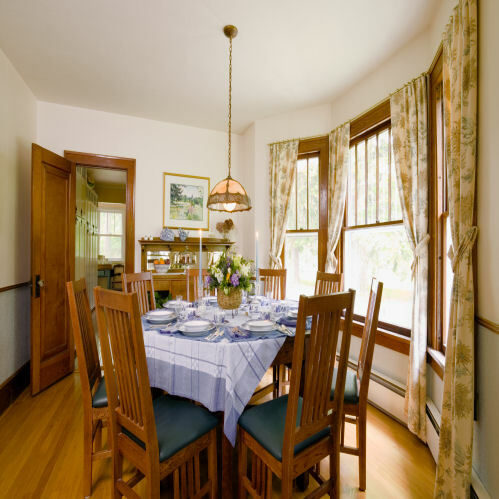 Located just two miles from the Massachusetts border and 12 miles from the Connecticut border, The Honored Guest Bed & Breakfast offers easy access to a wide variety of attractions. No minimum stay required (Except for Falcon Ridge Folk Festival and Holiday Weekends) We are full for Falcon Ridge, you can ask to be put on our waiting list. 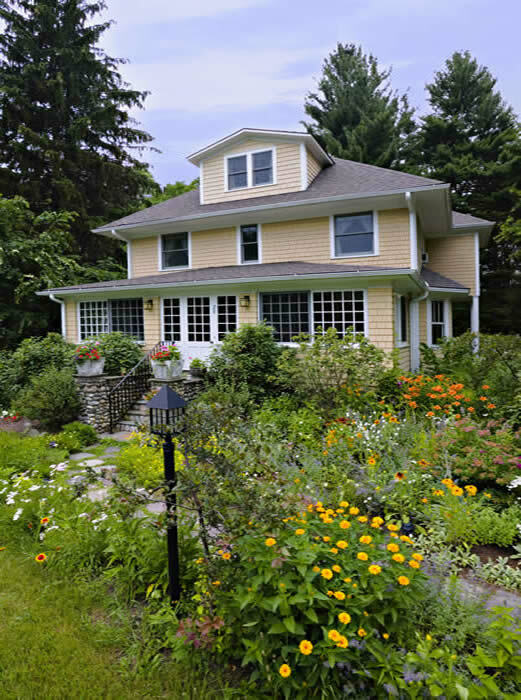 The Honored Guest Bed & Breakfast boasts an impressive architectural heritage. The house was built in 1910 as the guesthouse on Ledgewood Estate, the country home of the renowned architect, James Renwick, Jr. (St. Patrick’s Cathedral, the Smithsonian Institute). In a rather dramatic departure from Renwick’s signature Gothic Revival style, his family chose to celebrate the austere simplicity of the American Foursquare / Prairie House design of the equally renowned architect Frank Lloyd Wright. Perched atop a 3 ½ acre parcel of manicured lawns, towering evergreens, glorious old maples and perennial gardens, today’s honored guests will enjoy design elements retained from the Arts and Crafts period. Unusually large vertical-paned blown glass windows grace the first floor, dark oak molding and gorgeous hardwood floors are found throughout, and, typical of Wright’s designs, the natural surroundings outdoors are incorporated into the house’s interior design for both visual pleasure and temperature control. In deference to Wright’s vision, the oversized living room is now furnished with authentic Arts and Crafts pieces. Your mornings in the country begin with a full,delicious breakfast elegantly served in the formal dining room. Be sure to visit the menu page for a sampling of the breakfasts offered at The Honored Guest. Note that the menu changes with the seasons to allow us to offer the freshest possible produce. We serve only home made and fresh items. We are happy to honor special food requests. Please visit the guest book page to see testimonials from just a few of the many satisfied guests that we have had over the years. You'll find that breakfasts here are a wonderful part of your stay! 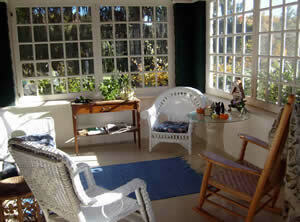 During the day, you will find a warm and welcome place to relax and visit in the comfortable living room. In the Spring through Fall you can enjoy sitting on the front porch and listen to the sounds of the Peepers, birds and waterfall. At night, upon returning from your evening out you find your beds turned down, the curtains drawn and a carafe of water and a chocolate at your bedside. Every effort is made to ensure a comfortable and pleasurable experience here at The Honored Guest. Regardless of which season you choose or what your interests are, Columbia County, New York and the Southern Berkshires area of Massachusetts offer the finest of attractions. To accommodate your pleasures, we are open year round. Within 25 minutes of our door, you can enjoy the magnificent music all summer at Tanglewood in Lennox, MA, or closer by, you can experience fine acting at Great Barrington’s Berkshire Theatre or Shakespeare & Company. Visit the Norman Rockwell Museum in Stockbridge, MA, or spend an afternoon at the Shaker Museums, Library and Villages in both Massachusetts and New York. We will be glad to make reservations for you at one of our many excellent restaurants, including John Andrews or Local 111. Columbia County’s own Falcon Ridge Music Festival is minutes from our door in Hillsdale, New York. For more highbrow sounds, visit the Hudson Opera house in Hudson, New York. Be sure to stroll down Warren Street and stop by the many antique shops, art galleries and restaurants. Columbia County boasts over 100 antique shops and is also in the heart of the Antique Auctions region of the Northeast. Several historical sites, from Martin Van Buren’s Lindenwald to Frederick Church’s Olana to the Edna St Vincent Millay Historic Site, are also wonderful sites that are open from Spring through the Fall. For your relaxation, you may choose to attend the free community meditation at Won Dharma Center on Saturdays from 10-11:30 am. Be sure to visit the world reknowned Hawthorne Valley Farm Store for fresh organic goods. For outdoor pleasures, guests at The Honored Guest will find that they are only 10 minutes from the Harlem Rail Trail for biking, and renowned Bash Bish Waterfalls, Washington State Park and Taconic State Park for hiking. Experience Tree Top family fun at Catamount Adventure Park. Swim and picnic at Copake Lake and Taconic State Park, or golf at one of three nearby public courses. Guided canoe/kayak tours can be arranged through The Audubon Society. Bicycles can be rented locally at Bash Bish. For your winter adventures, Catamount offers a wonderful skiing or snowboarding experience just two miles from our door, while Butternut Basin is only a 20 minute drive. We offer discount lift tickets to both resorts as part of your stay with us. Cross-country skiing is available at numerous trails throughout our area and at Butternut Basin. There is also a fitness center and pool available for $2 a visit at the local high school. Ask about our local hiking and biking maps. Come visit the Honored Guest, where you will feel at home among friends! For information about our policies or to reserve a room, please contact us (518) 325-9100 or toll free at (866) GUESTS1. You can also email us at reservationshonoredguest@gmail.com. We look forward to making your stay a most pleasurable one!